So simple, I feel kind of ridiculous blogging about it. However, it is my favorite way to have a vodka tonic! So I felt the need to share, I'm just like that. Just a hint of pineapple flavor doesn't make it too sweet. 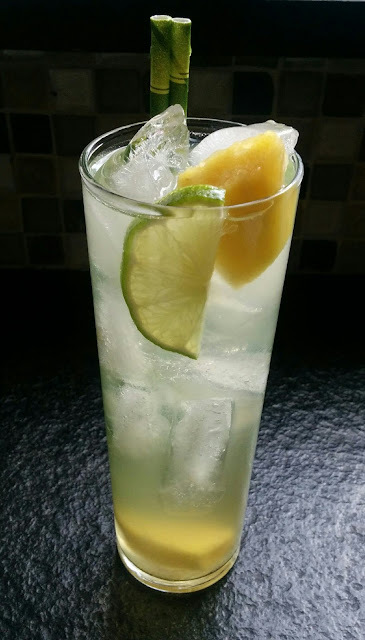 Still some of the refreshing bitterness of the tonic that you may like so much, with a hint of pineapple flavor. If you wanted to really get fancy, you could freeze some fresh pineapple chunks and use them instead of ice cubes too. I haven't tried that one, I just think it would be nice. I'm not too much of a sweet breakfast person, so while I love traditional Dutch Babies served with powdered sugar, it's just too much some days. I felt this would be perfect for a nice relaxing Sunday brunch, and had to give this a try. 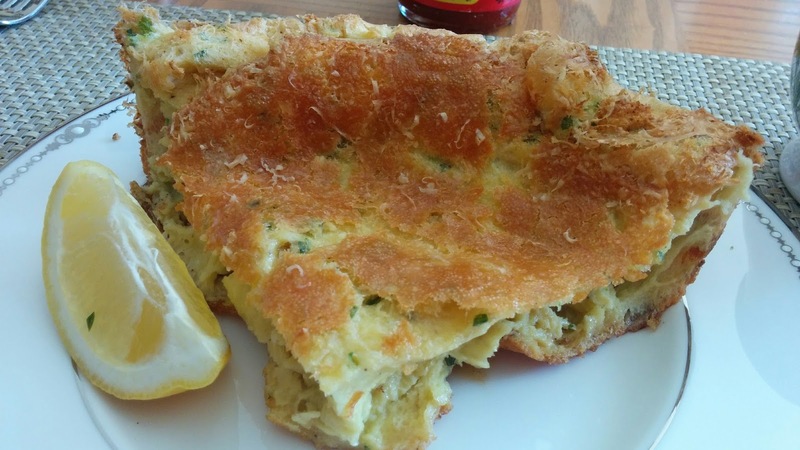 The Parmesan cheese on the top bakes into a glorious crunchy, salty topping for the puffed and golden eggs. A squeeze of lemon, a touch of hot sauce (if you are like that... I definitely am! ), and enjoy! Here's a close up of the top after removing from the oven. This one was good enough to satisfy for a light Meatless Monday dinner too! I saw this New York times article and I couldn't wait to try this. I didn't change much of anything in this recipe, though I did sub whip cream (1/2 cup, 1/4 water) for the 3/4 cup of whole milk. Note: I used a 10" cast iron pan and it almost went over the top! Maybe put a cookie sheet below your pan, just in case. 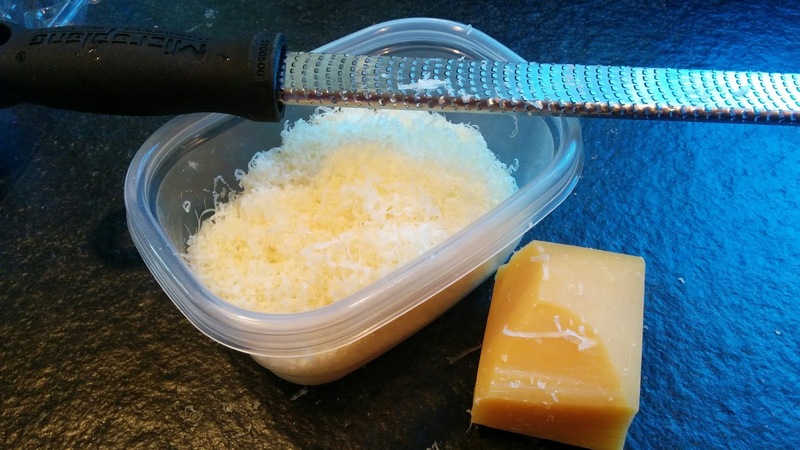 First, grate your Parmesan. I love to use my microplaner for super soft fluffy mounds of hard cheeses. Heat oven to 425 degrees. 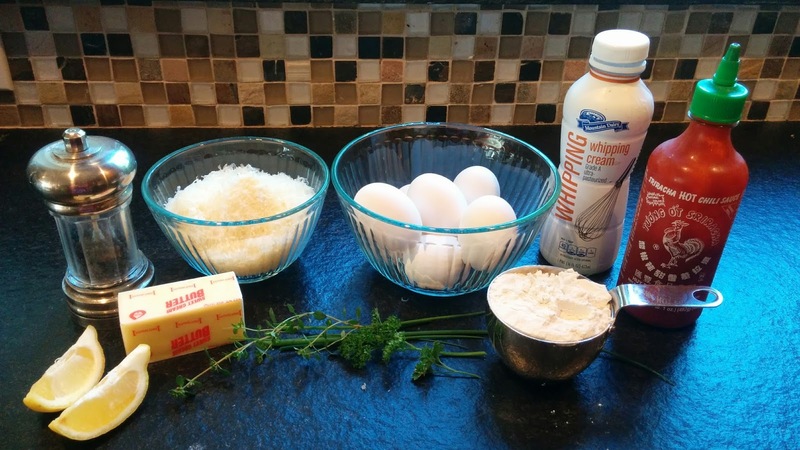 In a large bowl, whisk together flour, salt and pepper. 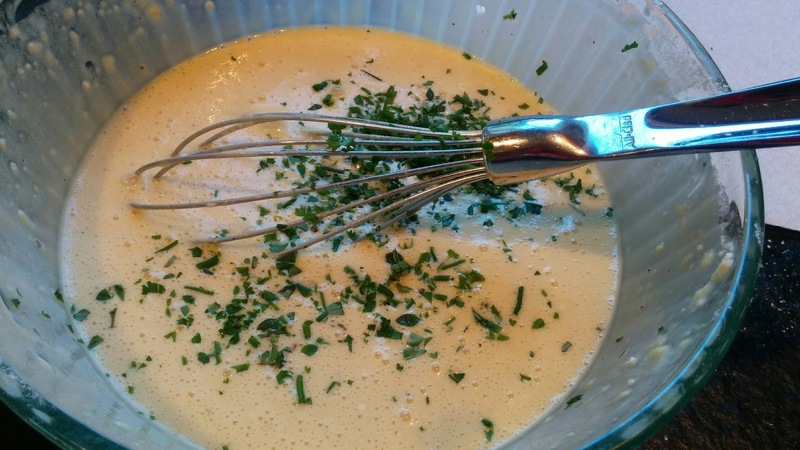 In a separate bowl, whisk together eggs and milk. Whisk wet ingredients into dry until just combined. Stir in thyme and the other herbs. 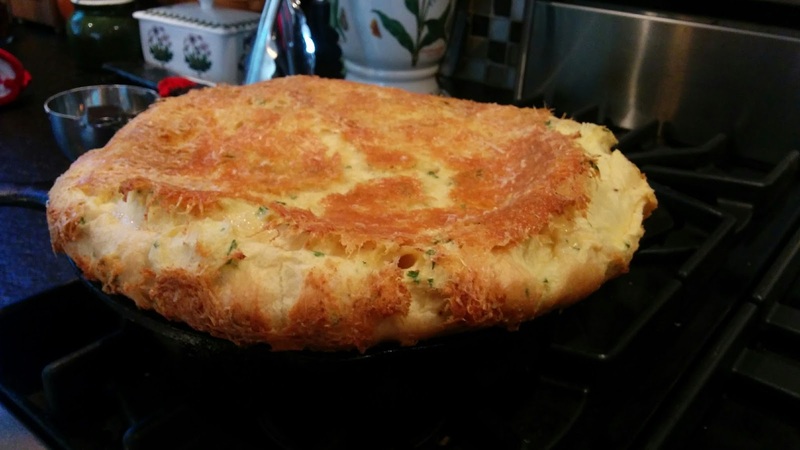 Melt the butter in a heavy 12-inch ovenproof skillet over medium heat. Let it cook until it smells nutty and browns, about 5 to 7 minutes, then swirl skillet so that butter coats bottom of pan. Be sure not to burn it, go low and slow. 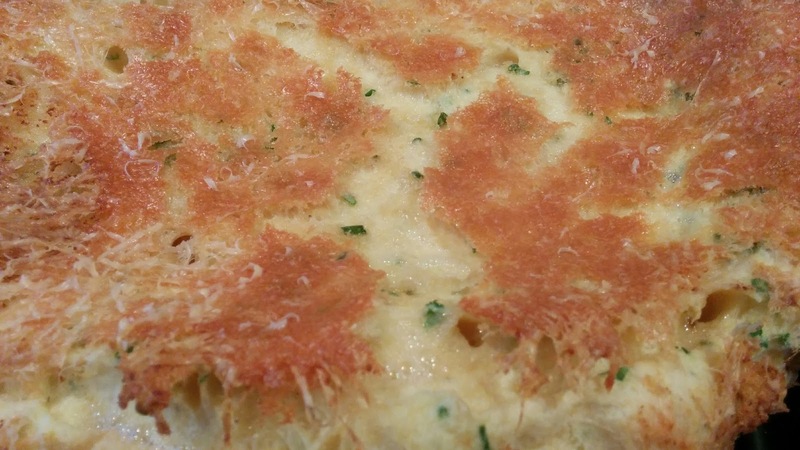 Pour batter into brown buttery pan and scatter cheese and flaky salt over the top. Here's what mine looked like. Bake until puffed and golden, about 23-5 minutes. Serve with sriracha and lemon wedges on the side. Hey Everyone! Please welcome my very first guest blogger! Andrew Lowe is a buddy of mine who is in a great local Seattle band. Not only is he a fantastic musician, he can cook and write too. He's very funny, I like that! With spring comes summer salads, fresh fruit, produce, and that damn ice cream truck that plays Merry Christmas for some odd reason. While summers are great for barbecues, I do not have that luxury. So tonight’s meal can all be accomplished with an oven and some counter space. 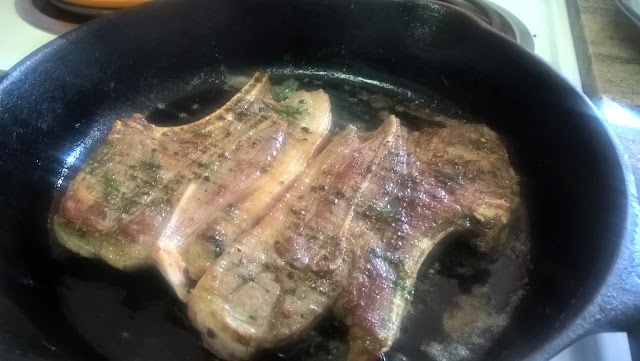 People I’ve met often think of lamb as an exotic meat and refrain from buying it at the market. But really it’s not that different from beef. It’s a lot leaner and has a stronger flavor, which means you can add stronger spices and herbs to it without losing the original flavor. Lamb chops and ground lamb tends to run on the pricey side but blade cuts (like the ones used here) tend to be around $5 for two. Chop the white bulb into thin slivers about an inch wide –after you’ve held it like the heart of your enemy or at least that person who stood on the left side of the escalator. Jerk. 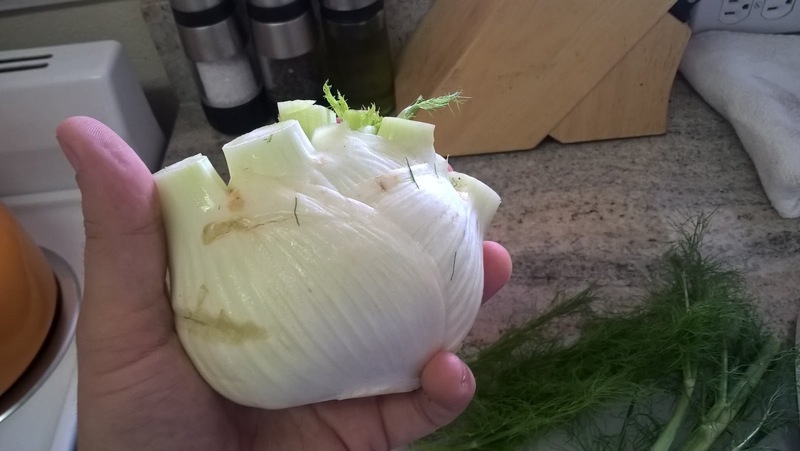 Put the diced fennel in a plastic bag with a little salt pepper and olive oil. Shake the crap out of it. Let rest for five minutes. Separate the fronds from the stalk by hand and rough chop. Open the canned garbanzos and drain into strainer. Run under cold water moving around with fingers to remove the outer shells (these are okay to eat but may add an odd texture to the salad. Take the glass baking pan out of the preheated oven and spread the chopped fennel evenly in the pan. Place in oven and set timer for 45 minutes. 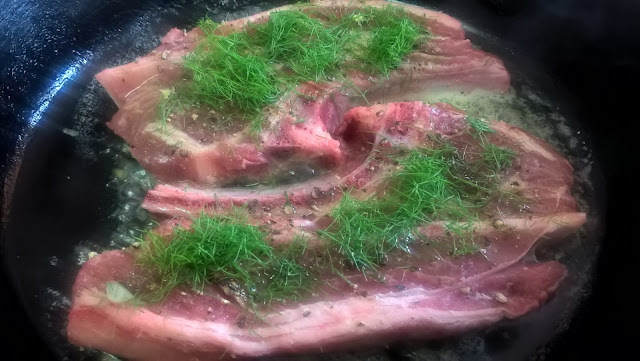 Season lamb with salt, pepper –I tend to go heavy with the pepper. Add a healthy portion of fronds and top and drizzle some olive oil on top. Flip and repeat. While the fennel is cooking we’ll prep the salad. Add garden greens to bowl, chop and add strawberries. We’ll eventually add the fennel when it’s done baking and has cooled. For right now open up the oven and stir it around. You want them to look crispy and brown on the outer edges. Dressing time. 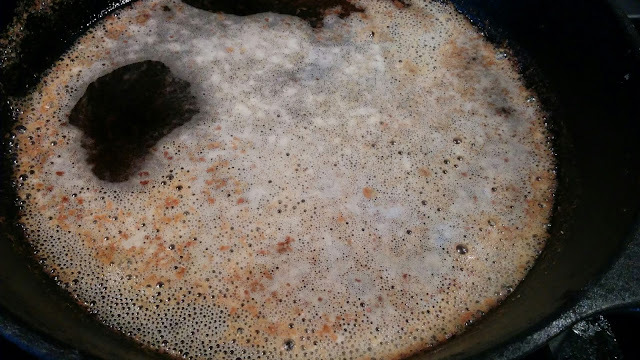 Combine 3 Tbs olive oil, 2 Tbs apple cider vinegar, lemon juice, salt, pepper, and ½ Tbs tahini. The tahini gives it a creamy texture and adds some sesame taste as well. Let it rest for about 5 minutes. Now let’s pull the fennel out of the oven. Since it’s going in the salad you’ll want it to come to chill or at least come to room temperature. Take it out of the pan and place on a plate. Let rest in fridge for at least five minutes. Now you’ll want to lower the oven temp to 375. Time to get out the cast iron skillet. Set your burner with the cast iron on top to a high setting. We are going to sear the hell out of it. After about 5 minutes your skillet should be good and hot. Not yet smoking but a noticeable heat with your hand about 7” away from it. Add the butter and as soon as it’s all melted add the blade cuts. For me it took four minutes per side, but your oven may differ (I hope it does my oven is tiny.) 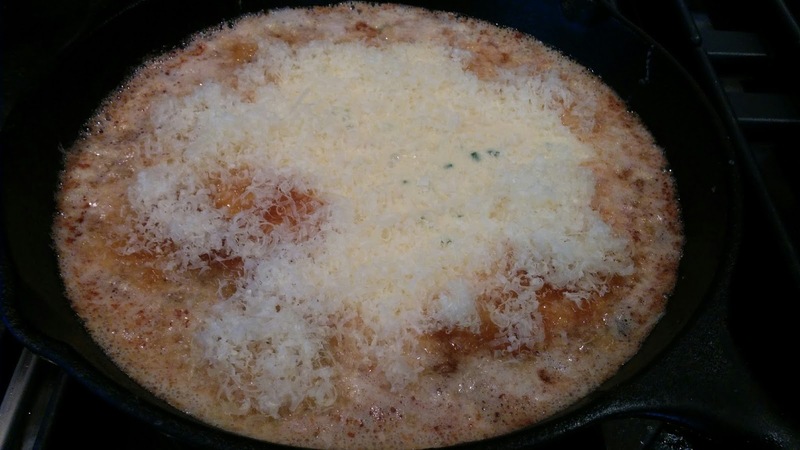 Take the skillet off the burner and throw it in the oven for 8 minutes. 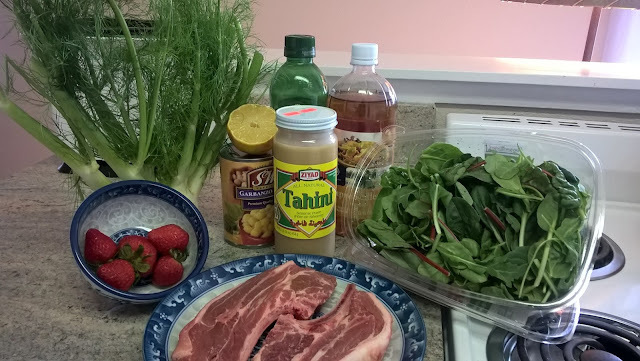 While this is happening you should add the fennel to your salad and add the dressing. The lamb is done when it has a little give but goes firm when pressed. Enjoy. I apologize for the blurry pictures. It’s always great when you miss the most critical shot. 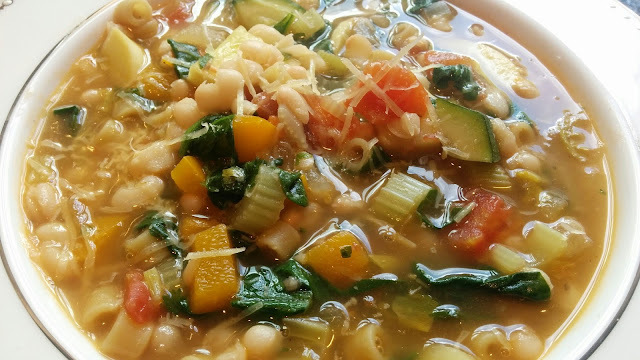 Fresh, fast and healthy, perfect for a rainy summer day, like today in the Pacific Northwest. Lots of fresh veggies make this one different from the heavy traditional kinds. 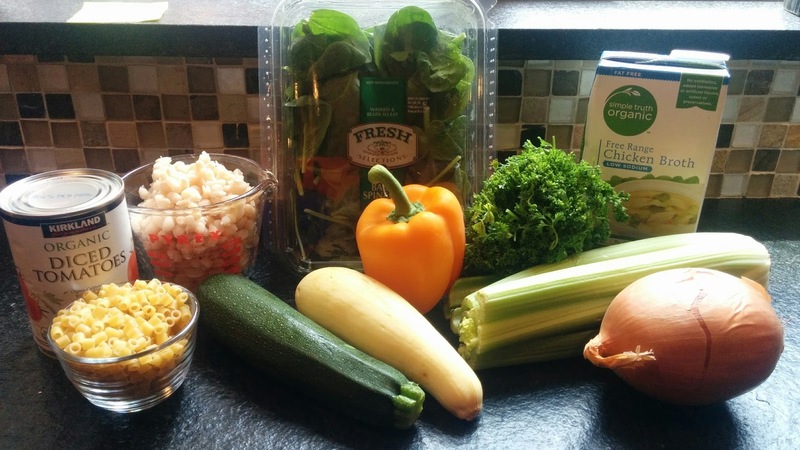 Easy to adjust for the veggies you have on hand, but I do like to focus on the green veggies. This would also be good with fresh green beans, or peas. Something light and healthy that you could eat with friends and family on the deck this summer! 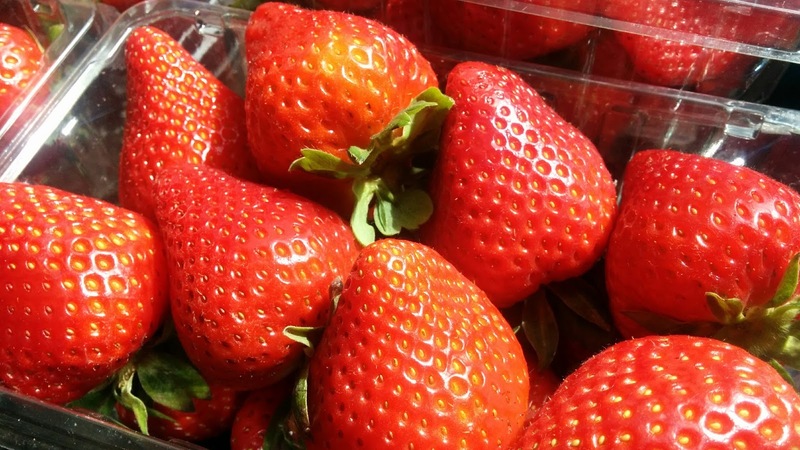 Crisp, tangy, salty, creamy and peppery, topped with sweet delicious strawberries! This is such an easy appetizer, different and fun, perfect for a Summer party on the deck with some friends! I got a call out of the blue. 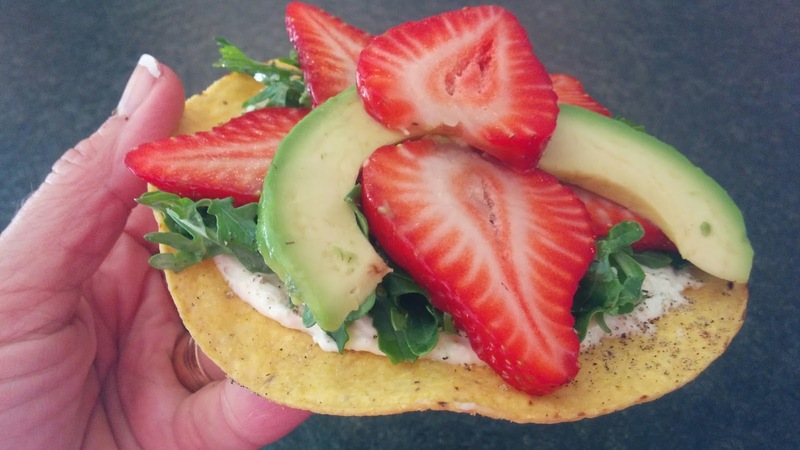 I was being asked to create a blog post to celebrate California Giant Strawberries! In full disclosure, they are paying me, and they sent me a special delivery of Giant strawberries too! I must be living right to have this fall into my lap! I think everyone can get excited about the new crop of fresh strawberries after a long winter and rainy spring. But my friends, NOW is the time to get out and get some of these California Giant Strawberries. If you are a Costco shopper (like you know I am) they are easy to find in the big 4lb tubs, plus lots of local grocery stores, like QFC and Fred Meyer are highlighting these right now too. While I know that you can think of the popular strawberry stand-by recipes (strawberry shortcake, strawberry scones, strawberry smoothies, and more). I wanted to make something different with these strawberries! My inspiration for this dish was from a recent trip to Southern California for a personal trip. We ate at this cute place in Hollywood where they made appetizer tostadas out of the pre-crisped corn tortillas with crazy veggie and cheese combination. - Freeze them to make great low-calorie smoothies that are thick and cold like ice cream! - Make a strawberry simple syrup, and then you are most of the way there to make a great iced beverage, like a strawberry margarita, daiquiri or martini, or no alcohol strawberry iced tea. I did my research and this is a very cool company; family owned, earth friendly, and many philanthropic initiatives to support their community who just happens to grow the biggest, most beautiful strawberries that I have ever seen! 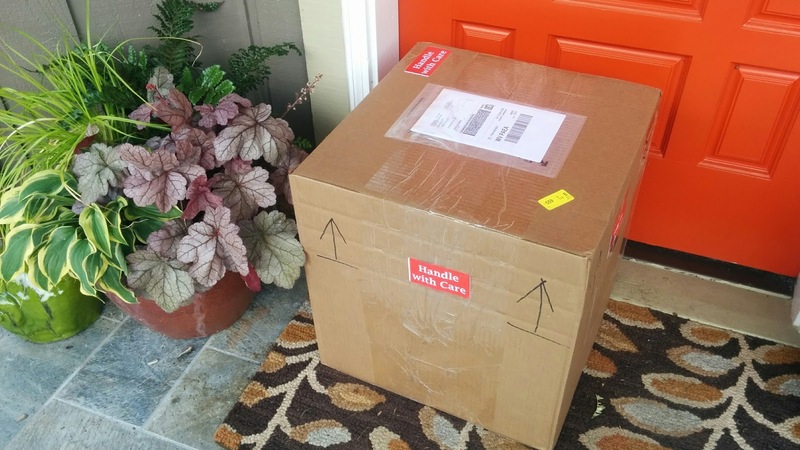 Plus, look what was on my front door step when I came home from work the other day? It’s the best time to buy them right now because of the flavor and seasonality – stock up and freeze for later! In a food processor, thoroughly mix the cream cheese and the feta until you have a soft spreadable mixture. In a bowl, add the arugula, or baby spinach, and toss with a little bit of olive oil, salt and pepper. Go easy on the salt as the feta/cream cheese mixture is salty too. Slice the strawberrries into a bowl, toss gently. 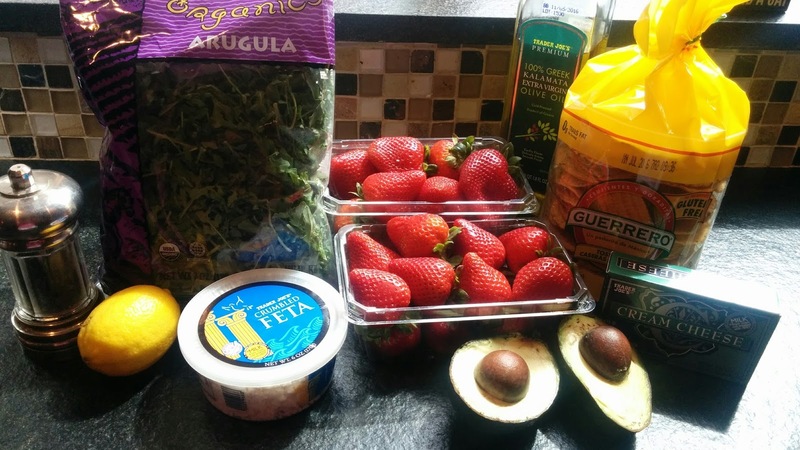 No sugar will be needed for this dish, the berries should be fresh, tangy and sweet, perfect contrast to the creamy avocados and peppery arugula.. I'd suggest enjoying these on the deck as a "happy hour" snack with a glass of wine, beer, or heck, why not a strawberry margarita??? I'm always on the look out for things to do with the cooked, frozen prawns that I buy at Costco. It's such an easy way to make a great dish. They thaw quick and are very tasty too. 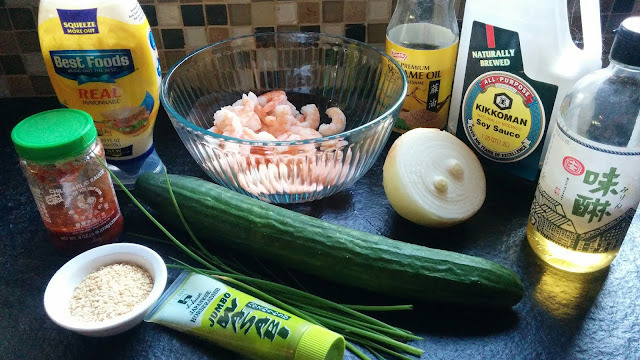 This recipe was a side benefit of making this recipe for Sushi Shrimp Stack. 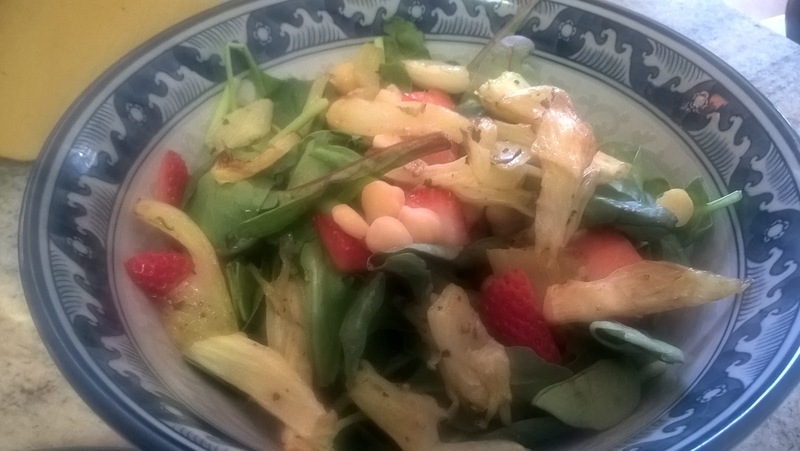 A nice light salad perfect for a hot summer day's lunch, or dinner. Drain the prawns after thawing and add to a medium serving bowl. 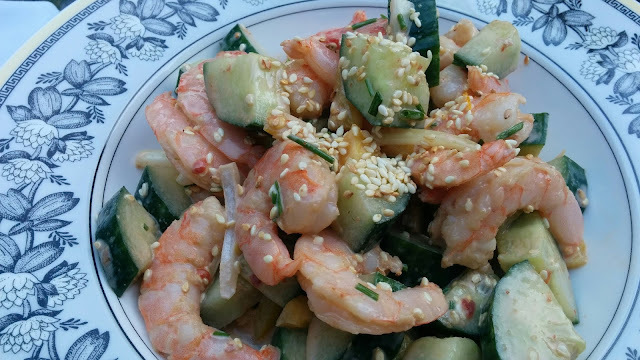 In a small bowl, make a dressing of the rice vinegar, mayo, soy sauce, sesame oil and wasabi. 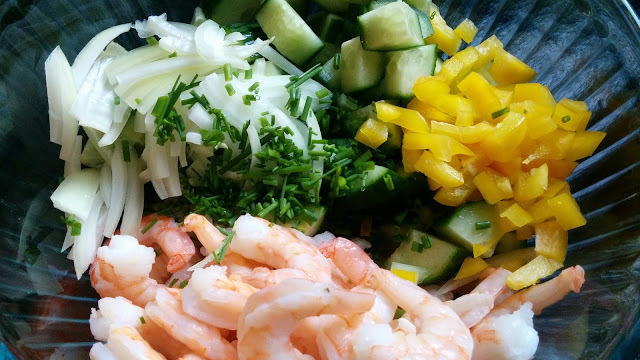 Cut up the veggies, add to the bowl with the prawns in the bowl. Stir in the dressing. Sprinkle with sesame seeds and serve. You can make this up a couple hours ahead and chill. 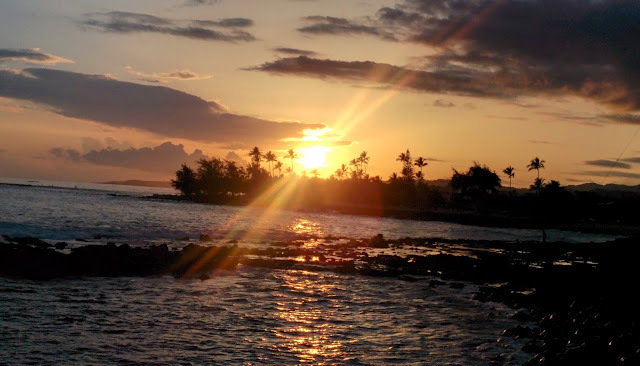 Just got back from Kauai. Sigh. It's hard to come home. However, here's an easy little invention that we cooked while we there in the townhouse that we rented. I'm one of those weird gals that LIKES to cook while on vacation, yeah, sure, I do like to go out and eat, but one of the pleasures is sitting on the deck, with friends, enjoying a drink while enjoying the sunset. And the guys are cooking at the BBQ, yep, that's fun to me. We had a lot of pineapple juice (3 BIG cans), fresh huge pineapple and other goodies from our Costco shopping stop in Lihue. It's crazy how much stuff that 4 people can put in a cart when power shopping on your first day of vacation. What a hoot. We got some great items for our week... luckily we got to split that bill for the cart full of Costco stuff. 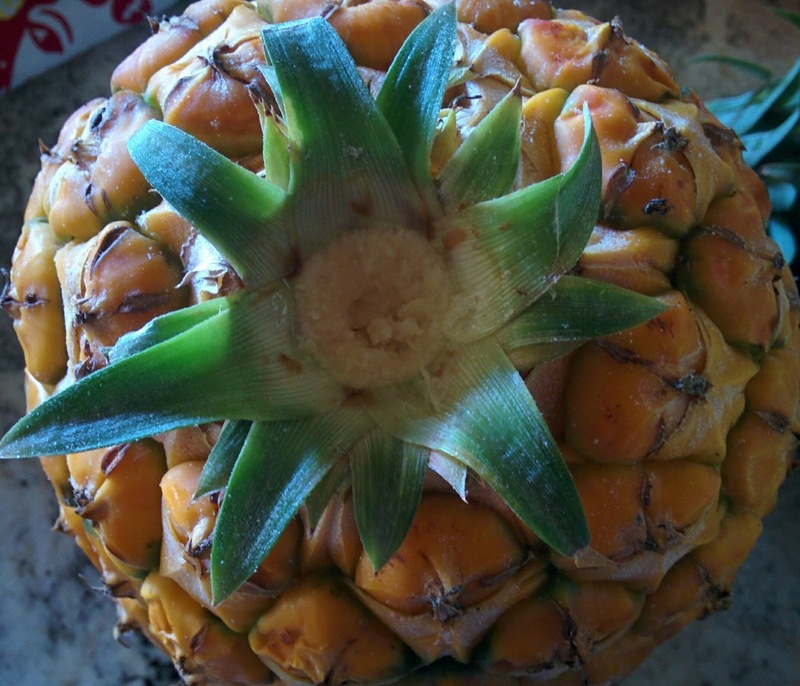 I will say, you could make this with canned pineapple chunks! That way you'd have the already cut chunks, and you could drain the juice to use as the marinade as below. One note of caution, I would imagine that canned pineapple make the dish a little sweeter. 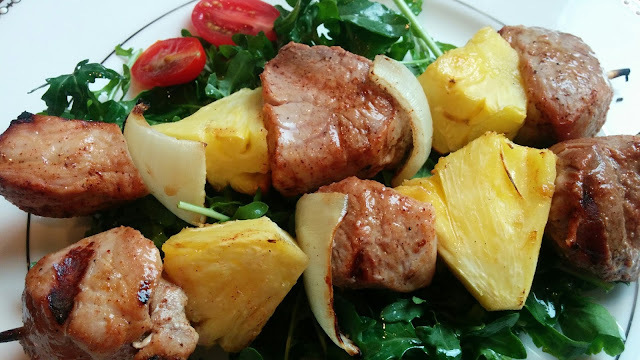 Probably not a big deal as part of the yumminess of this dish is the savory pork with the sweet pineapple and the grilled onions. Enjoy! Soak the bamboo skewers, this keeps them from burning while on the grill. 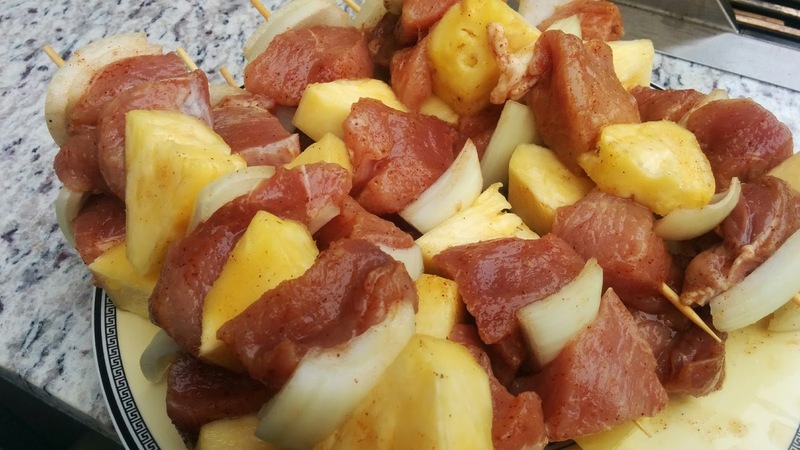 Soak skewers, thread the white onion, pork, pineapple, alternating until each skewer is filled. 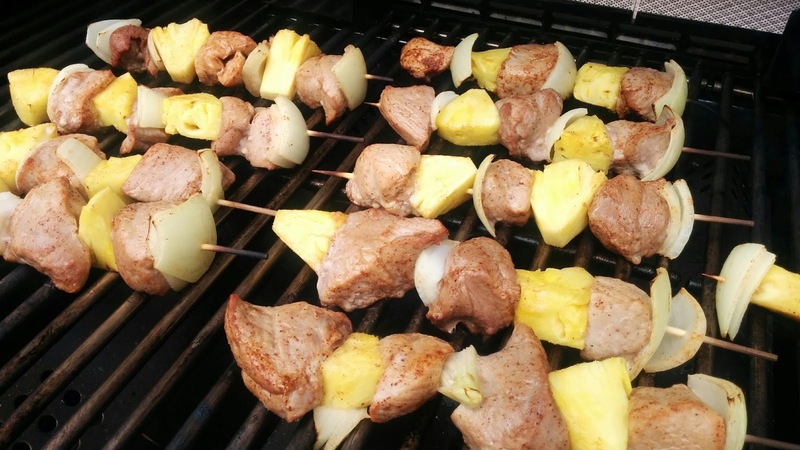 Heat up the grill to high, then turn down the heat to medium high after you add skewers. We cooked them for about 12 minutes, but it could depend on your grill and how done you like your pork. The suggested internal temp for pork is now 145, which usually means it has a small amount of pink inside. In case you need a little picture of a Hawaiian sunset to enjoy with your dinner, here you go!